Bioderma is a brand that's new to me, but one that has almost cult status in the beauty world, perhaps almost due to one product - their micellar water. I'll come back to that later - first a bit about Bioderma if you've not come across them. It's a French company who work closely with dermatologists and international research centres to produce dermo-cosmetic products which are intended for medical prescription - so you know that they're going to put substance above frills. They have a number of different ranges, depending on your skin type: Sensibio for sensitive skin, Hydrabio for dehydrated and sensitive skin, Atoderm for dry skin and Sébium for oily skin. 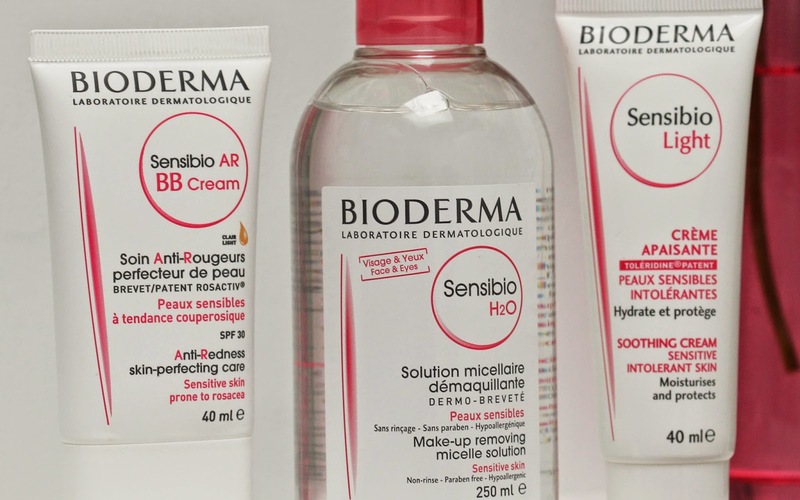 When I went to the Bioderma launch of their new Sensibio Anti-Redness BB Cream I was told that the Sensibio range would be best for my skin type. I don't feel like I have too many issues with my skin, it's generally spot-free and doesn't react to any creams I put on it - but I figured that you can never go wrong if you're using sensitive skincare. 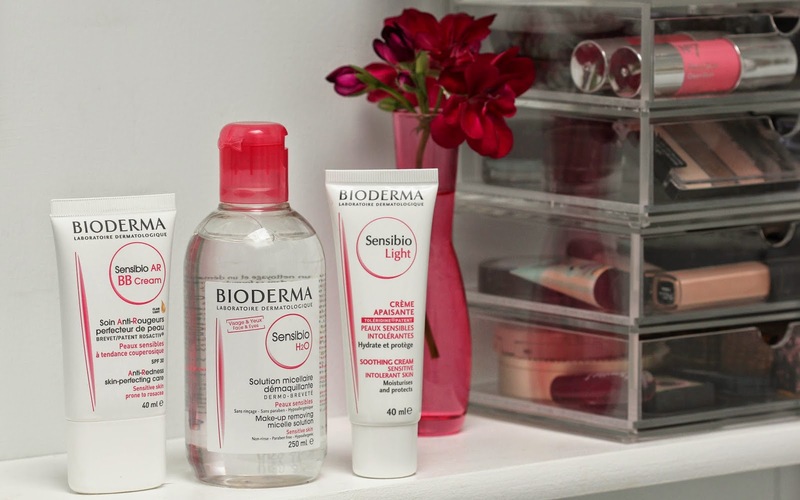 I've been trying out three Bioderma Sensibio products. The Sensibio Soothing Cream* (£14.30/40ml) is a light moisturiser with a silky smooth texture and no fragrance. I've been using it in the mornings under my make up and it's been keeping my skin hydrated and soft in this hot sunny weather. It's a nice moisturiser which does its job well, but to me it doesn't seem particularly special. Maybe it's because I like a moisturiser to have a light scent. The new Bioderma Sensibio Anti-Redness BB Cream* (£16/40ml) is a lightweight BB Cream specially designed to combat redness and reduce the 'overheated' feeling in skin that is prone to redness. Like I said, my skin isn't too bad, but I do sometimes get a little redness in my cheeks and redness if i have a spot. I was a bit concerned about the one-colour-for-all nature of this BB Cream because when I've tried products like this in the past, they've never worked for my skin tone. However, I was really impressed with this one - and at the launch event we all tried it out on our different-toned skin and it seemed to work for pretty much everybody. I've been using it in place of my usual light foundation, because my skin fortunately doesn't need heavy coverage. I've found it gives a nice colour to my skin and evens out all the patches (including the red ones), with a slightly velvety finish. It lasts well, though I have to redo my make up if I'm going out in the evening as my skin tends towards shiny by the end of the day. It's probably not going to be my daily go-to base but if I'm having a little bit of a red skin day, it's what I'll be reaching for. The real winner of the three products I've been trying out is the Bioderma Sensibio Micellar Water* (£9.99/250ml) and it's totally clear to me why it is such a hero product. I tried my first micellar water recently (the REN 3 in 1 cleansing water) and was rather disappointed that it really didn't remove my make up, particularly my waterproof mascara, very well. However, the Bioderma one is awesome - I love how refreshing it feels, but mainly I love how brilliantly it does its job of removing all traces of make up. I honestly don't think I'll ever use (or even bother trying) another one again. Plus, this one is cheaper than the REN one. Bioderma produtcts are available from leading pharmacies and dermatologists nationwide, including www.johnbellcroyden.co.uk, www.zestessentials.com and www.escentual.com. (The prices I've quoted are RRPs - I've found a variety online, so shop around). Published for the First Time: Girl Talk Magazine!